TV series of 5 episodes, written and directed by Nevejan, and a multimedia project with dance. The Dutch National Ballet stepped into Nevejans dream of creating a Canta ballet with 53 handicapped people and their cars. Thus enabling us to connect bodies in top condition and disabled ones, man and machine, high culture and popular culture, and people in all corners of society. The project includes a book, a tv-series, a registration of the ballet, live performances and a radio making off documentary. Through GPS tracking even poeople who were too sick to make the performance could make a walz in their own neighboorhood. An International version of 80 minutes will be made in 2016. 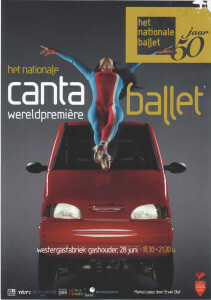 Here you find te five episodes of the TV documentary Nationale Canta Ballet so you can see them on internet or order the Dutch National Canta Ballet DVD at Maartje. The National Canta Ballet: double pas-de-deux on YouTube. Blog article about The Dutch National Canta Ballet.